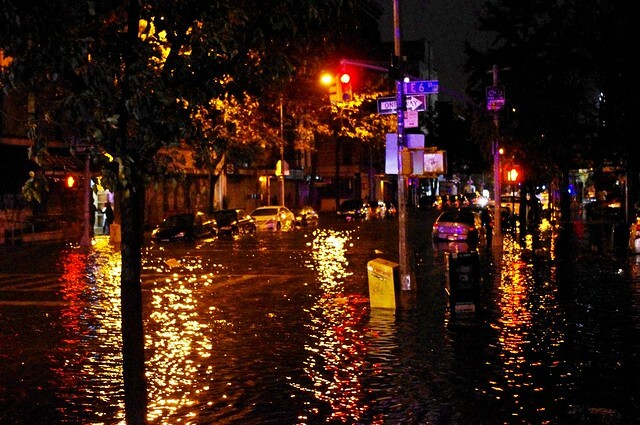 Hurricane Sandy flooding New York’s East Village. The most trenchant piece of media criticism you’re likely to see this week — this month? this year? — is an essay by journalist-turned-climate activist Wen Stephenson that appears on the cover of this week’s Phoenix. Our most respected climate scientists … are increasingly clear and vocal about one thing: we’re rapidly running out of time to address climate change in any meaningful way and avoid the risk of global climate catastrophe, with the incalculable human suffering that it will bring, quite possibly in this century. In the face of this situation — as much as it pains me to say this — you are failing. Your so-called “objectivity,” your bloodless impartiality, are nothing but a convenient excuse for what amounts to an inexcusable failure to tell the most urgent truth we’ve ever faced. What’s needed, Stephenson says, is for the media to move beyond the political near-silence that has descended over the climate-change issue and instead focus relentlessly on the subject. It’s a good, important piece, and you should read it. Nevertheless, I have some quibbles. First, I think Stephenson, for all his experience, misapprehends the limits of journalism. It’s not like our best news organizations have ignored climate change. They’ve reported on it frequently, prominently and with great skill. But they’ve done it in an oxygen-deprived environment. That is, a story in the New York Times or on network television, no matter how it’s played, is not going to get the sort of traction Stephenson would like to see without the oxygen of an engaged political system. That’s not to say Jim Lehrer, Candy Crowley or Bob Schieffer couldn’t have put President Obama and Gov. Mitt Romney on the spot during the presidential debates. But that wouldn’t come close to the intensity generated by genuine political engagement, congressional hearings and the like. Climate change has slid off the public agenda. Journalism’s ability to force it back onto the agenda is not nonexistent, but it is limited. Second, Stephenson’s argument does nothing to answer the sinking feeling I get whenever I read about climate change — that it’s already too late in many respects, that nothing we can do would offset the massive damage that is already occurring and that, essentially, we’re screwed. I’m not suggesting we be spared the truth. But that’s not the sort of message likely to lead to much more than sullen desperation. Our climate is changing. And while the increase in extreme weather we have experienced in New York City and around the world may or may not be the result of it, the risk that it may be — given the devastation it is wreaking — should be enough to compel all elected leaders to take immediate action. So maybe facts on the ground — and in the sky, and the oceans — will accomplish what journalism has not: force all of us to take climate change seriously. Of course, we can’t pretend to know the relationship between Sandy and global warming. But it’s worth asking whether the storm was more severe than it would have been absent climate change; whether more storms like it are occurring; and whether Sandy caused more devastation than it otherwise would have because the seas are higher than they used to be. Don’t misunderstand me. I completely agree with Stephenson and his observation that the mainstream media tend to seek consensus over difficult truth-telling. Maybe events like Sandy, and leaders like Michael Bloomberg, will start to change that consensus. Photo (cc) by David Shankbone and republished under a Creative Commons license. Some rights reserved.